These classes are ideal for any propane service techs, drivers, managers as well as well as plumbers, heating & cooling contractors, architects and anyone dealing with propane design and installation. 8:30 am - 3:30 pm * Breaks & Lunch included. Certificates of attendance will be issued. For Registration details, Check out our Meetings Page! The intent of this educational program is to provide a part of the necessary formal training needed when addressing propane emergencies. The training is based on commonly used practices, referenced laws, regulations, and industry standards, it is not meant to set a standard of operations for any emergency response organization. It is the responsibility of each attendee to remain current with industry procedures, regulations and product developments which may improve personal health and safety. If applicant's application is approved, the West Virginia Propane Gas Association will provide up to $4000.00 for the purposes of reimbursement of the cost of an appropriate instructor with equipment to conduct the class, copies of the most recent edition of Propane Emergencies workbook, and/or food for attendees. Any expenses over this amount are the responsibility of the applicant. The West Virginia Propane Gas Association assumes no liability for reliance on the contents of this program. The program is offered as a guide only to assist expert and / or experienced instructors and managers in the training of their personnel. Acceptance of applications is done on a first come, first served basis. For those interested, please download the application and find out more about the applicant's responsibilities and application procedures. 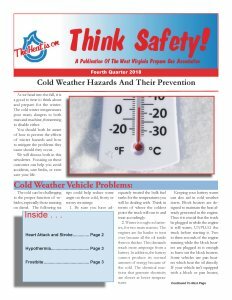 Go to our Newsletter Page and Download Think Safety! Officials with the WV Division of Weights & Measures are reminding all propane marketers doing business in the state that there are specific regulations governing sales, advertising and receipts for all purchases of propane. They also have new procedures which need to be followed when an inspector is checking a propane facility. This document details what must be followed and what a company can be cited and fined. The Federal Motor Carrier Safety Administration (FMCSA) has published the long awaited Hours of Service of Drivers' Final Rule. The new definition of on-duty time is effective February 27, 2012. The definition is revised to allow a team driver to log as off duty up to 2 hours spent in the passenger seat either immediately before or after the 8-hour period in the sleeper berth. Additionally, time spent resting in or on a parked commercial motor vehicle is excluded from the definition of on-duty time. Compliance for all other rule changes is not required until July 1, 2013. The purpose of the rule is to reduce the possibility of driver fatigue by limiting, on a continuing basis, the ability of drivers to work the maximum number of hours currently allowed, or close to the maximum. Long daily and weekly hours are associated with an increased risk of crashes and with the chronic health conditions associated with lack of sleep. The rule purports to reduce the risk of fatigue and fatigue related crashes, as well as harm to driver health. Daily Driving Time Limit - NPGA successfully voiced objection to FMCSA's proposed change to limit daily driving time to 10 hours. The current 11-hour daily driving time limit is unchanged. 60/70-Hour On-Duty Limit - The 60- and 70-hour limits are also unchanged. A driver may not drive after 60-hours on duty in 7 consecutive days, or 70-hours in 8 consecutive days. 14-Hour Driving Window - The maximum driving window will continue to be 14 consecutive hours after coming on duty. 34-Hour Restart - FMCSA is revising the HOS regulations to limit the use of the 34-hour restart provision to once every 168 hours (7 days). On average, this will cut the maximum work week from 82 to 70 hours. The new rule also requires that drivers working long enough to need a restart take off 34-consecutive hours that includes two night periods from 1am to 5am Only drivers who drive nights or work more than 60 or 70 hours in a week will be affected. 30-Minute Break - The rule includes a provision that allows truckers to drive if they have had a break of at least 30 minutes, at a time of their choosing, sometime within the previous 8 hours. However, the final rule requires that if more than 8 consecutive hours on duty have passed since the last off-duty (or sleeper-berth) period of at least half an hour, a driver must take a break of at least 30 minutes before driving. For example, if the driver started driving immediately after coming on duty, he or she could drive for 8 consecutive hours, take a half-hour break, and then drive another 3 hours, for a total of 11 hours. Alternatively, a driver could drive for 3 hours, take a half-hour break, and then drive another 8 hours, for a total of 11 hours. In other words, this driver could take the required break anywhere between the 3rd and 8th hour after coming on duty. A driver who plans to drive until the end of the 14th hour and wants to take only one break will need to take a break between the 6th and 8th hour after coming on duty. Drivers will have great flexibility in deciding when to take their break. By postponing the latest point at which the break can be taken from the 7th to the 8th hour, the rule will make it significantly easier for team drivers to fit their break into their schedules. Team Driving - A team driver may log as off duty up to 2 hours in the passenger seat of a moving vehicle immediately before or after an 8-hour period in the sleeper berth. Beginning January 3, 2012, a new regulation from the U.S. Department of Transportation (DOT) restricts drivers of commercial motor vehicles (CMVs) from using hand-held mobile phones while driving. DOT's final rule, published December 5, 2011, amends both the Federal Motor Carrier Safety Administration's (FMCSA) Federal Motor Carrier Safety Regulations (49 CFR 390, 392) and the Pipeline and Hazardous Material Safety Administration's (PHMSA) Hazardous Materials Regulations (49 CFR 177.804). This ruling follows on the heels of a previous 2010 DOT decision to mitigate risks associated with 'distracted driving' by banning commercial drivers from texting while driving. The new restrictions on using hand-held mobile phones applies to both intrastate and interstate drivers as PHMSA's jurisdiction applies to all motor carriers operating CMVs hauling hazardous materials requiring a DOT placard. DOT's rule is important to propane marketers because dispatchers typically communicate with cargo tank drivers in the field by cell phone. The bottom line for compliance is that if the phone is mobile and must be held in the driver's hand when used, then its usage is prohibited when operating (driving) a CMV on a public highway or street. The prohibition includes periods when the CMV is stationary at traffic lights, stop signs or heavy traffic, etc. However, a CMV driver may still use a hand-held mobile phone as long as he/she is pulled over on the side of a public highway or street where the vehicle may safely remain stationary. Additionally, hands-free cell phones such as a speaker-phone are still permitted to be used while driving. Drivers waiting in line at a terminal with engines idling are permitted to use hand-held mobile phones as long as the CMV is stationary. Under emergency conditions, hand-held mobile phone use by HAZMAT drivers operating a CMV on a public highway or street is permitted. Two way radio communication such as with a Two-Way Radio/CB is unaffected by the new rule and still permitted as the DOT lacks jurisdiction to regulate such devices. Drivers that violate the new policy can be fined up to $2,750 for each offense, while companies that allow their drivers to use hand-held mobile phones while driving could be fined up to $11,000. As cold weather prompts your customers to turn up the heat, remind them to have a trained service professional perform a complete check of their home heating system and other propane appliances. An online module on appliance maintenance makes sharing the message with your customers as easy as pressing a computer key. A recent poll on WVPGA's Facebook page has indicated that most respondents expect this winter to be colder than last year. How prepared are you for this winter? There are things you should be doing before the first flake falls as well things to do during and afterwards. Watch this informative and interactive program on Winter Storm Preparedness (you will need Adobe Flash player to watch). See how prepared you really are! Pursuant to the ... codes, and based on the information you [Rudy Seacrist] have supplied, these [propane] technicians would not be required to obtain a plumbers' license." A letter, dated October 29, 2008, to WVPGA Lobbyist Rudy Seacrist from Commissioner David W. Mullins details the statement. Please download and read the letter. The U.S. Department of Homeland Security (DHS) published its final "Chemicals of Interest" list or Appendix A in the Federal Register on November 20. The 60-day compliance countdown for propane marketers is now ticking down. Propane marketers must register with DHS by January 19, 2008. On August 24, 2007, DOT's Federal Motor Carrier Safety Administration (FMCSA) finalized a rule that established initial fees for 2007 and a fee bracket structure for the Unified Carrier Registration (UCR) Agreement.